Many musical influences are reflected in this inspiring collection of original songs that express heartache, heart-sing and humor... a soulful blend of blues, country, rock and jazz. 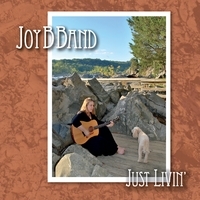 Just Livin' is Joy B Band's debut CD, recorded and mixed by Ray Tilkens, Ambient Recording Studios, mastered by Grammy Award winning mastering engineer Bill Wolf, Wolf Productions. Known for their energetic and tight live shows Joy B Band is a rich, melodic, and driving fusion of blues, rock and country with a jazz float …one of the most sophisticated bands to come out of the legendary Washington, DC music scene in recent memory. The writing, musicianship, engineering and mastering on this recording are impeccable. Chip Clemmer - drummer/percussionist, who brings to the table over 26 years of national and international touring experience at the concert hall and arena level. Adding their talents to Just Livin’ are keyboardist, David Gorozdos; pianist, Liz Lohr; guitarist, Michael Tash; guitarist, Ray Tilkens... all first-call, world-class, musicians in their own right. If you only buy one CD this year this is the one to purchase. You will play it until it wears out!